When I was a kid, my mom bringing home the Sears Holiday Catalog felt like getting ONE MILLION DOLLARS dropped into my lap. For a few delicious hours, I could have EVERYTHING I EVER WANTED [that was sold at Sears]. I went through it in three calculated stages - first, dog-earing pages featuring anything I was remotely interested in. Next, I dreamily reviewed those pages and used a broad-tip, exquisitely toxic black marker to circle those items I actually thought my parents might buy for me. Finally, I neatly wrote the item descriptions & quantities of everything I truly desired on notebook paper and if I desperately needed something (like the popularity-enhancing matching Shaun Cassidy pants and t-shirt), I would cut out the catalog picture and glue it on the notebook paper next to its listing. (Got the t-shirt but not the pants and, sadly, popularity remained static). I still relish the idea of creating wish lists - for everyone, not just myself; sometimes I add things to my kids' Amazon lists because I am certain they simply did not think of asking for Star Wars trombone music or a German pencil sharpener but would really love getting it. Today, with less than 3 weeks until Christmas [yes; try not to panic], I am designing lists of gifts I wish for certain people who inhabit my world. If I had a Sears catalog, I would cut out pertinent pictures and glue them on notebook paper, too, for emphasis. At my house it was the J.C.Penney catalog. My annual ritual was to imagine I would find under the tree one toy from each page. Decisions, decisions. This is a wonderful, witty post. Am never disappointed when I stop by your blog. I loved the Sears catalogue too! Great list! I wish the same things in some cases ;) I also think spending time over beverages with you would be a terrific way to pass some quality time. oh, I remember those days!!! 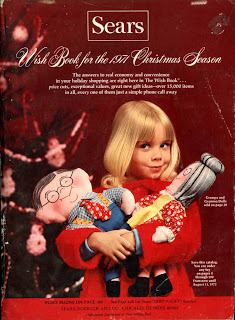 *sigh* I SO remember the Sears Christmas catalog. I spent hours poring through the toy section. Happy times!